On March 27th we will be in Sheffield working with Sheffield Doc/Fest and academics from the University of Sheffield, preparing for the 'Meet the Academics' session at Sheffield International Documentary Festival in June. The workshop will help the selected academics refine their ideas and practise their pitching skills. March 20th is the transmission date for Prof Richard Clay's latest documentary, How to Go Viral, on BBC Four. Richard is Professor of Digital Cultures at Newcastle University. He spoke about the programme on BBC Radio 4's Front Row on Friday 15th March and the programme also featured on Saturday Review. You can see the trailer here and read more about the programme here. In Feb The Academic Ideas Lab delivered training to the AHRC Leadership Fellows. Two short 'breakout sessions' in the day-long Leadership Fellows' Conference informed the Fellows about collaborating with radio and TV. Jan 2019 saw the launch of the 'Everything to Everybody' project, funded by the National Lottery Heritage Fund. The project aims to revive the incredible riches of the Birmingham Shakespeare Memorial Library and to use them to inspire the region's diverse communities. The Academic Ideas Lab will be supporting the consultation phase and providing input into project evaluation. There is more info here. "Thank you so much for putting on such an engaging and informative workshop. I feel like I learnt a lot about a new industry and sector, and I am much better informed of how research can be translated to engage a wider audience." "I just wanted to drop you an email to say how much I enjoyed the training yesterday. It was informative and clear; I really do feel like I have a much better sense of the industry and how academia can be a part of it." "I wanted to say thanks for putting together such a brilliant day for us on Tuesday! I really learnt so much and it was great to also connect with a few people in the industry." In November we were in Sheffield helping University of Sheffield academics prepare for the 'Meet the Academics' session at Sheffield International Documentary Festival 2019. As always it was a well-attended event. The next stage is for academics who attended to apply for the pitch workshop in March. In October we ran a training day for AHRC-funded Doctoral Researchers held at the MRC in London. In spite of the rail industry's best efforts a good day was had, particularly thanks to Wall to Wall, Twenty Twenty, Naked TV and FullFat TV whose development staff and execs came to explain what they are looking for in research-based ideas and to have one-to-ones with the researchers. Professor Richard Clay presented 'Two Minutes to Midnight' on BBC Radio 4 at 11am on Friday 7th September. Produced by Whistledown, the programme explores why we no longer fear nuclear holocaust. More info here. Richard is Professor of Digital Cultures at Newcastle University. New programmes announced - BBC Two have recommissioned 'A House Through Time' for a second series. Design expert on the series is Deborah Sugg Ryan, Professor of Design History and Theory at the University of Portsmouth. We are awaiting transmission dates for 'Viral', Richard Clay's new project for BBC Four, which we believe will be in the New Year. Meantime there's more info here. On the 15th August 'the One Show' screened a piece based on the research of Eva Balogh from the University of Portsmouth, 'The Last Usherette'. Eva researches the history of usherettes and 'the One Show' reported on a special event which brought together former usherettes from several decades of British cinema-going to tell their stories. At this year's Sheffield International Documentary Festival the Academic Ideas Lab's Lucy Vernall took part in the panel of the 'How to Pitch your Academic Idea' session, hearing research-based ideas from academics at the University of Sheffield. The session was held on the 11th June and was watched by an audience of television industry members and festival goers. Alongside Lucy on the panel were TV commissioners and TV producers from both the BBC and from independent companies. Also in June Lucy Vernall was interviewed by the Research Comms Blog, giving some thoughts and tips on transferring research to radio and TV. You can find that episode here. Our post on the LSE Impact Blog was published on the 3rd May, looking at how researchers can gather information about the significance as well as the reach of research broadcast on TV and radio. ​In March The One Show on BBC One featured a piece about the AHRC-funded research project being carried out by Prof Alison Ribeiro de Menezes at the University of Warwick, looking at the stories of Chilean refugees helped to come out of imprisonment and torture under Pinochet to safety in the UK by the World University Service. The piece featured stories from some of the Chileans who came here and of the British people who helped them. We are now conducting a series of focus groups with the public to determine the significance of the piece in terms of learning about what happened during and after the coup, and in terms of changing attitudes to asylum seekers. Our research paper co-authored with Dr Melissa Grant and Dr Kirsty Hill has been published in the journal Research for All. 'Can the research impact of broadcast programming be determined?' looks at how to evaluate the REF-able impact of research being featured in mainstream broadcast programming. Research For All is an open access journal and you can read the paper here. ​A House Through Time, BBC Two's new 4 part history series, aired in January and featured design expert Professor Deborah Sugg Ryan. Deborah is Professor of Design History and Theory and Associate Dean Research in the Faculty of Creative and Cultural Industries at the University of Portsmouth. She appeared on screen and also worked behind the scenes on the series as a consultant. There's more info on the series here. A House Through Time is presented by David Olusoga and produced by Twenty Twenty/Warner Brothers UK. ​The 5th December was a condensed day of training (in more ways than one!) with the AHRC's New Generation Thinkers - some of the upcoming new faces and voices selected by the ARHC and the BBC to appear across TV and radio. In the evening was a New Generation Thinkers drinks party with many colleagues from BBC Radio who support the scheme. The next day we were at the NCCPE 'Engage' conference attending some thought-provoking sessions on public engagement with research, and catching up with some of the leading practice in the field. ​We led a very popular workshop with Sheffield DocFest at the University of Sheffield on the 29th November, preparing academics to apply for the 'Meet the Academics' session at 2018's festival. Later that day we attended the Women in Film and Television event in Birmingham with Channel 4 commissioners Vivienne Molokwu and Becky Cadman, who provided a sneak peek at their upcoming shows. ​On the 9th November we attended the One World Media Trust's workshop on Authentic Storytelling at Channel 4, and afterwards were delighted to join the AHRC at BAFTA for the Research in Film awards. Professor Richard Clay's new 3 part series aired in the 9pm slot on BBC Four in August. Richard is Professor of Digital Humanities at Newcastle University and ARHC Commons Fellow. 'Utopia: In Search of the Dream' explores visions of utopia and what they reveal about our deepest hopes, fears and dreams. Richard was recently named on the BBC's 'hotlist' of top 100 new talents. We're proud to say we got him started out in his presenting career, which began with BBC documentaries 'The French Revolution: Tearing Up History' and then 'A Brief History of Graffiti'. 'Utopia: In Search of the Dream' is produced by independent producer ClearStory. ​(Richard with actress Nichelle Nichols, with whom he discusses Star Trek in Episode One of Utopia). We ran the On Screen Talent Market again on June 14th at Sheffield Doc/Fest. You can see our lineup of new talent who participated here. We were thrilled to have some of the top people in the factual TV industry participate, including training delivered by Leili Farzaneh of STV and agents Sue Rider, Sophie Laurimore and Debbie Catchpole, who between them represent clients including Professor Brian Cox, Dr Dawn Harper, Dr Michael Moseley, Dr Hannah Fry, Neil Oliver and Prof Tanya Byron. After their training our new talents had curated one-to-one meetings with radio and TV companies including Twenty Twenty, Dragonfly, 7Wonder, Optomen, Whistledown, Wingspan, Woodcut Media, BBC Studios, Barcroft Media, Nerd TV and Pioneer Productions. We are hopeful that after another very successful Market the scheme will run again next year - we'll keep you posted as and when applications open. On Wednesday 8th March we were at the University of Sheffield delivering a training day prior to the 'Meet the Academics' pitch at Sheffield International Documentary Festival in June. As well as DocFest colleagues we were joined by Rob Holloway, Executive Producer at Discovery Networks International. It was a really useful day, even if punctuated by the fire brigade turning up, and resulted in a number of academics being selected to pitch at the Festival in front of producers and commissioners. ​Notes on Blindness was on BBC Four on Thursday 16th Feb, as part of Storyville. It is no longer available on iPlayer but it is on Curzon Home Cinema in a variety of accessible versions. We're thrilled to be evaluating the impact of this truly groundbreaking film that was nominated for 3 BAFTAs. We'll post links to our British Film Institute Insight Report here as soon as it's available. On 15th December 2016 we ran a workshop with Dr Melissa Grant at the University of Birmingham on how to evaluate the impact of research on TV and radio. This event was primarily for academics and professional services staff at the University of Birmingham. 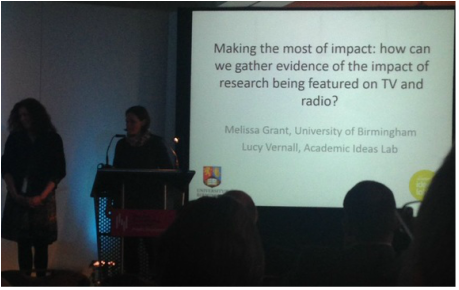 At the NCCPE 'Engage' conference in Bristol on the 29th November we presented our joint work with Dr Melissa Grant on how to evaluate the impact of research being featured on TV and radio. It was a very popular session with delegates (helped no doubt by us sharing a bill with Paul Manners and Sophie Duncan on 'Lessons from the REF') and we were delighted that it was attended by Steven Hill, Head of Research Policy at HEFCE. We hope the results of our work will soon be available as a journal paper - we'll let you know here once it's published. If you missed it at the cinema, Notes on Blindness is available on demand on several platforms including BFI Player and Curzon Home Cinema. On 21st June we took part in the AHRC Commons 'Common Ground' event at the Ron Cooke Hub, University of York. The Academic Ideas Lab presented a session called 'Developing and evaluating research-based TV and radio: An in-a-nutshell guide to collaborating with producers and how to evaluate the impact of resulting broadcasts.' Common Ground was a fascinating and diverse collaborative and co-produced gathering of arts and humanities researchers, projects and initiatives - see some of what happened at @ahrccommons #ahrccommons and @AHRCcommons360 which has 360 degree views. We also attended the PraxisUnico conference on 16th and 17th June, joining colleagues from the world of academia who specialise in the field of knowledge exchange, and the 'Lessons from the REF' NCCPE training day in July. On June 15th The Academic Ideas Lab worked with Sheffield International Documentary Festival to deliver the 'On Screen Factual Talent Market'. The On Screen Factual Talent Market is Sheffield Doc/Fest’s exciting new training and networking initiative bringing together promising factual talent with producers, commissioners and other decision makers keen on uncovering new talent. It provides a forum for academic experts who want to share their expertise on television in both on-screen and advisory roles to meet with TV professionals. 18 experts were selected from a competitive field, including anthropologist Dr Kit Opie and cardiologist Dr Ami Banerjee from UCL, engineer Dr Emma Carter from Sheffield Hallam, research fellow Dr Adam Smith and robotics expert Dr James Law from Sheffield, molecular virologist Dr Lisa Cross, and postgraduate students archaeologist Jo Tonge from Southampton and chemical engineer Rosalind Davies from Birmingham. The experts received training from The Academic Ideas Lab, from TV Executive Richard Bowron (Love Productions, Shine, BBC), and from medic and TV presenter Saleyha Ahsan (Trust Me I'm A Doctor). The afternoon of the 15th was the Market itself, in which the experts met leading decision makers from factual television in curated one-to-one meetings. The whole day went smoothly and successfully and we hope to hear news of resulting developments and collaborations over the next few months. Thanks to the Marketplace Manager Anna Parker and to Jenni Tuovinen, Marketplace Sessions Coordinator, for their hard work and superb selection and matchmaking skills. 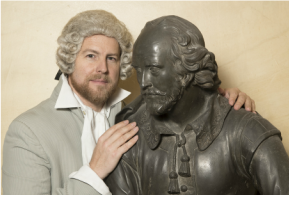 'Shakespeare's Tomb' premiered on Channel 4 on Saturday 26th March. You can see a trailer here and watch the programme free on All4 (signup required). The Academic Ideas Lab took this project to Channel 4 and worked with academics and producers Arrow Media to bring it to the screen. The programme has been transmitted around the world. 2016 is the 'Shakespeare 400' anniversary, and we worked with the BBC and the Shakespeare Institute on some of the coverage of the special events in Stratford-Upon-Avon. Our contribution kicked off the central celebration weekend at 7.30pm on Friday 22nd April on BBC Radio 3 and also as a live global broadcast on bbc.co.uk/shakespearelives​ with a special 'In Concert' featuring the recreation of Garrick's Ode to Shakespeare, given by Samuel West, and a newly commissioned Ode for the 400th written by the Poet Laureate, Carol Ann Duffy, with music by Sally Beamish. You can watch it on iPlayer if you're in the UK, or on the Shakespeare Lives site if you are elsewhere in the world. There was also a special 'Words and Music' featuring readings by current Shakespeare Institute students, which was live on Radio 3 from their 'popup studio' at the RSC (you can listen here) and an episode of Free Thinking on The Winter's Tale featuring Professor Michael Dobson. We're still working on finishing the full impact evaluation of this huge undertaking! 'How to collaborate with radio and television producers to create ideas for chemistry-based content' ran on the 8th January 2016, supported by the Royal Society for Chemistry Outreach Fund. Many thanks to Aston University for hosting us, particularly to Dr Sarah Lee and Matthew Richards in the Research Support Office. 'Fantastic workshop', 'I understand what producers are interested in a lot more now', 'The most fun I have had at 'work' in a very long time'. We hold a small number of training sessions at universities for staff in Research Support, KT/Impact and Public Engagement offices on spotting research proposals with potential for broadcast collaboration. Working together right from proposal stage is the very best way of bringing research to the screen. If you're interested in us coming to visit your team, contact us for more information.